Check out this photo of the new X-band tracking radar designed as part of the missle defense shield. It’s being loaded for transport to Alaska for permanent installation. As the tech market re-inflates it is important to keep a perspective on reality. At one point Sycamore Networks (SCMR), with virtually no revenue, was worth more than Caterpillar (CAT), an industrial powerhouse. Caterpillar is the poster boy for Macro, supplying massive hardware for massive engineering projects like mining and construction. One of my investors was intelligent enough to see that markets were overlooking the importance of Macro and went long Cat’ and smaller old-economy companies like ASV (ASVI) back in 2002. Even after the telecom bubble was exposed as hype, investors still felt that companies whose business is to bend metal and build big things were too ‘old-economy’ to be worthy of their attention. It turns out that you couldn’t have done much better since then than invest in Mining, Oil & Gas Production/Exploration and the Heavy Industry companies that make it possible. All of the focus on the sexiness of Micro- silicon and optical components, hardware, software, Web 2.0, blah blah blah makes it easy to overlook the importance of Macro efforts and the scale involved. These will always be challenging problems with significant rewards for the smartest people and companies that can solve them. 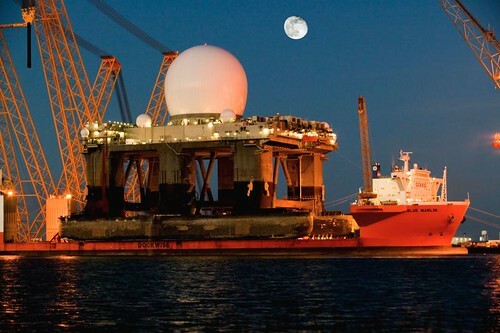 Meeting silicon chip design timing, orchestrating complex software infrastructure, and designing high speed electronics in FR4 still don’t hold a candle to loading 10000 tons of metal onto a boat for shipment from Houston to Alaska through the stormy Straights of Magellan. Nothing impresses me more than the people who make efforts like this successful. I know a Senior in Mechanical Engineering at Bucknell University who will be working at Boeing next year on the 787. He’s thrilled. It’s great to see people charged up about building big, tangible, old-economy things. But there is nothing old-economy about the way the 787 is designed, tested, and built. Macro is, and will always be, a challenging and profitable endeavor. The fruits of the new economy just let people do Macro faster, cheaper, and better. I rest easier each nite knowing that we are prepared to meet any and all threats that the Soviets can throw at us . . .